Tabby’s Coffee is excited to showcase new resident Chelsea Bonacello who is new to this area. Chelsea showcase in her words “This show is my visual work. Meditative and healing for me…and hopefully, likewise for others.” Her work is whimsical and colorful and delightful. 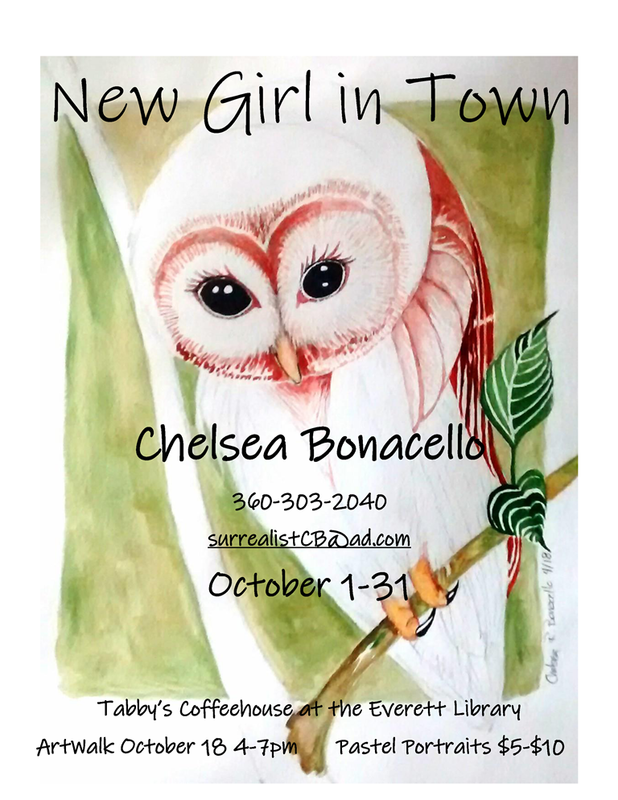 During the month of October and during the Everett Art Walk, view Chelsea’s delightful artwork from 4 – 7 pm. A reception for Chelsea will start at 5:00 p.m. and you can meet this gifted artist. Also very proud to present our Young Artist Annika Bauer with acrylic on canvas and Alicia Jenkins. Continuing artist Story Johnson with upcycled mix media and Rising Stars Artist, M. Ortega, D. Ortega and Jaylynn Moor.